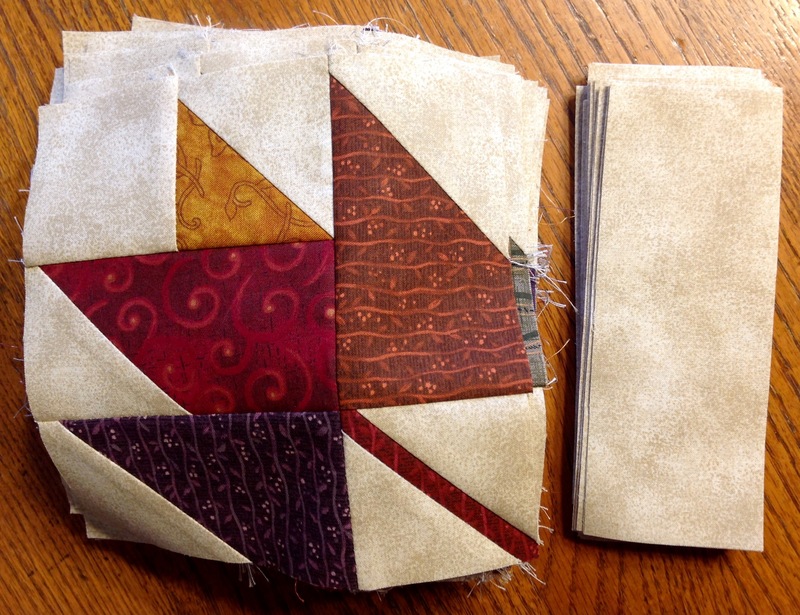 The fifth and last day of my quilting retreat finally arrived. By this time I was exhausted. Most of the spring in my step had pretty much disappeared and my mind felt a bit foggy and sluggish. But with only half a day left I had much I wanted to accomplish, so there was no time to waste. When I turned off my sewing machine the day before I had stitched together twenty-four of the forty-eight flower blocks needed for the Harvest Melody Quilt. With my confidence high that I could finish the remaining blocks before it was time to leave I wasted no time getting started. One by one I pulled together the units that made up each flower, then stitched and pressed their seams. With a whopping ten minutes to spare I finished the very last one. I was also able to cut and stack the spacer rectangles that would be inserted between each of the flowers. While I was not able to get the Harvest Melody Quilt top assembled nor any progress made on the French Cottage Garden Quilt I was still very pleased with my accomplishments. I had finished way more that I had thought possible so how could I be disappointed. Here’s a photo of the stacked flower blocks. I hope to get the Harvest Melody Quilt top completed very soon. Some how I will have to sandwich it in between the five quilts I have waiting to be longarm quilted, my husband’s upcoming surgery and a week-long visit with my grandchildren. On top of that, when I arrived home yesterday, I was sad to discover that I had the early signs of another cold. The germs that were setting in would present yet another challenge. Oh well! One thing at a time. As I pulled into our driveway, at the end of my journey, I was warmly greeted by my husband. He was standing outside watching my progress on his Find Friends app. After sharing a warm embrace my husband and daughter quickly unpacked the car. Before I knew it my belongings were distributed to their intended locations. I was also pleasantly surprised to find that my husband had vacuumed all of the floors and did a bit of tidying up. How awesome! Thanks sweetie! Well that’s a wrap! I will update you on the progress I make while adding the finishing touches to each of my Mom’s quilts. Who knows…I may even revisit the French Cottage Garden Quilt. I had a wonderful time at my quilting retreat. Woodland Ridge Retreat center is a fabulous facility. If you ever have the chance to attend a class or want to schedule your own retreat I would highly recommend it! You won’t be disappointed! Many thanks for stopping by! I appreciate your interest! Thanks! I’ll take your suggestion under advisement. Spring and warm weather can’t come fast enough!!! !